The University of Queensland and University of New England collaborative study has shown that "off-the-shelf" drone imagery products, sold to growers for up to $4000 per farm in some cases, are unlikely to provide accurate information about the health of crops. Researcher Yu-Hsuan Tu, from the Joint Remote Sensing Research Program at UQ's Remote Sensing Research Centre, said he could understand why farmers would be tempted to use drone technology for farm management. "Drones can be deployed quickly to generate high resolution images attractive to growers seeking leaf-scale monitoring of their farms," Mr Tu said. "However our research has shown that the high-tech, multi-spectral sensors used to collect images from the drone must be processed in a certain way to obtain correct information for horticultural farming applications." He said one of the biggest problems in the use of drones was related to inconsistencies in the way light is reflected off the surface of vegetation, depending on the height at which a drone is flown and its angle to the sun. Such inconsistencies could result in farmers being given the wrong information about their crops if the data isn't processed in the right way by experienced operators with remote sensing expertise. "To compare reflectance across tree canopies, we flew a drone at different heights and angles to the sun above an avocado orchard, and found huge variations in the images collected," he said. "This means while differences in tree health might be determined from tree to tree in imagery from one flyover, subsequent flyovers will show the vegetation very differently unless the drone is exactly the same height and angle to the sun—something almost impossible to achieve. "In practice, this inconsistent imagery makes it impossible for farmers to compare vegetation conditions over time because the light variations are not corrected for height or angle and the product will be distorted. "This could lead them to draw conclusions about the decline or improvement of their crops that may be incorrect—assumptions that could prove expensive to farmers already under pressure from recent weather events." Mr Tu has created an algorithm that corrects these variations in reflectance to ensure the delivery of consistent data for farmers. 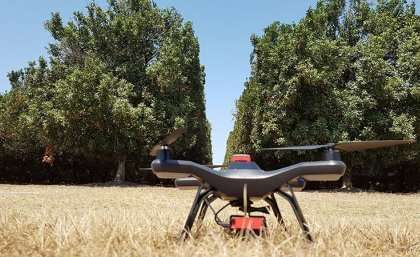 He is now working to establish standardised protocols for the acquisition and processing of drone imagery for tree crops to assist commercial suppliers and growers. Until then, he said farmers should undertake appropriate due diligence before spending substantial money on drone imagery for horticultural applications. "While the science behind our work is complex, the message to farmers is simple: use drone technology at your risk – more work needs to be done before drone technology can accurately determine the health of crops," he said. All the more reason to have a professional drone service company that is focused on agriculture work with the farmer. They will bring the right technology, domain expertise, pilots and software stack. They will be properly licensed and deliver consistent quality.